Since the most recent TIU 8-week Bikini Series challenge, I’ve been dying to get organized and create an Excel spreadsheet (anyone who knows me knows Excel + Me = #BOOM) where all the weekly challenges are laid out nicely, neatly, and organized. 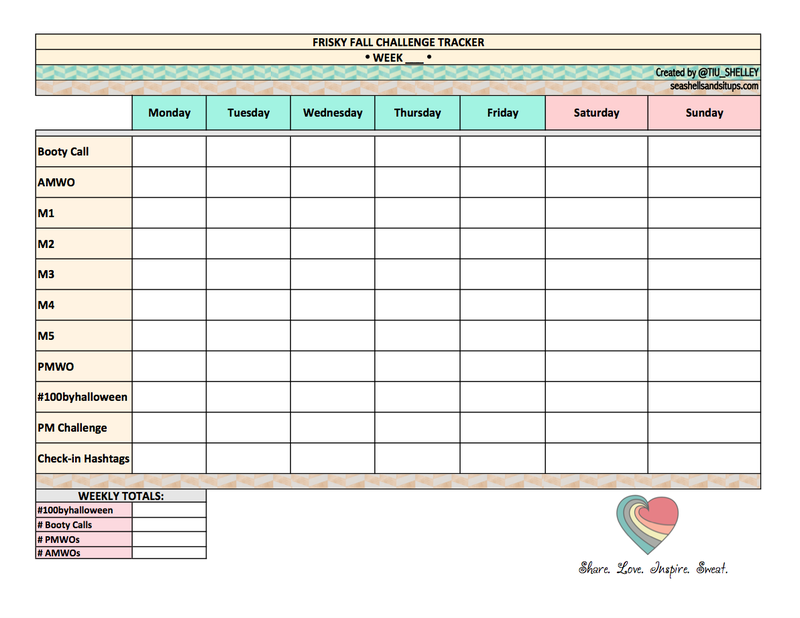 My wedding planning company, Better Half Weddings & Events, Inc., creates custom wedding planning spreadsheets for brides-to-be, and ever since college I’ve had a passion for creating organized spreadsheets to help keep people organized for various organizations. So when TIU presented all our workouts in a format that wasn’t geared for the busy mom who doesn’t have time to read through their entire posts a few times a day when working out, checking off the PM challenge, or searching for the minutes of cardio we’re challenged to complete, I knew it was time to step in! So FINALLY, almost to the day of my 6-month TIU anniversary, I’ve created a weekly spreadsheet where I’ve inputed the listed booty calls, workouts, PM challenges, and check-in themes/hashtags. The blank spaces are for you to input what you’ve completed. For example, fill in your meals under M1-M5, your total miles toward #100byhalloween, your additional PM or AM workouts (what AMWO and PMWO stand for), etc. The listed workouts don’t necessarily have to be completed in the AM or PM; you can do them whenever works for you. I’ve only used Google Docs a few times in college, and it’s been a while, so here is my attempt at uploading it there too; please let me know if it works! Please let me know how you like the layout! I’d love to hear from you! Hi Shelley, just wanted to stop by and say this planner is FANTASTIC! I have the same issue, I always find it difficult to have to scroll through workout posts oh my tiny phone screen to get to what I need…so thanks a million for this! Cute cute blog, and great TIU story. Happy #friskyfall! I love it! Thank you! Do you make these every week? Hi Shelley, I love the layout! This is so handy thank you! The organization is key! Any chance you wouldn’t mind sharing the online editable version as well! Thanks girl I love the site very inspirational! Hi, Sara!! Thanks so much! I always have issues with Google Docs (me not them haha), so can you tell me if this works?